Categories are a way to tag and organize pages on Mediawiki. You can categorize pages and files by adding one or more Category tags to the content text. These tags create links at the bottom of the page that take you to the list of all pages in that category, which makes it easy to browse related articles. You can browse all existing categories here. Please remind to categorize each page you create. We're working hard to get high quality PDFs directly from this wiki, based on mediawiki. If you replace NAME with the name of the page you wish to create, you will be taken to a blank page which indicates that no article of that name exists yet. Clicking the Edit page tab  will take you to the edit page for that article, where you can create the new page by typing your text, and clicking submit. usind the top tab 'Create PDF' and selecting the desired template. If you need, you can create as many templates as you want by simple creating and editing new pages 'W2L_TemplateName' in the namespace Latex. For the sake of clarity, please have a look at the deliverables template which is store here. New templates will automatically appear in the Latex/PDF options, not in the 'Create PDF' tab since that's a manually created short link. 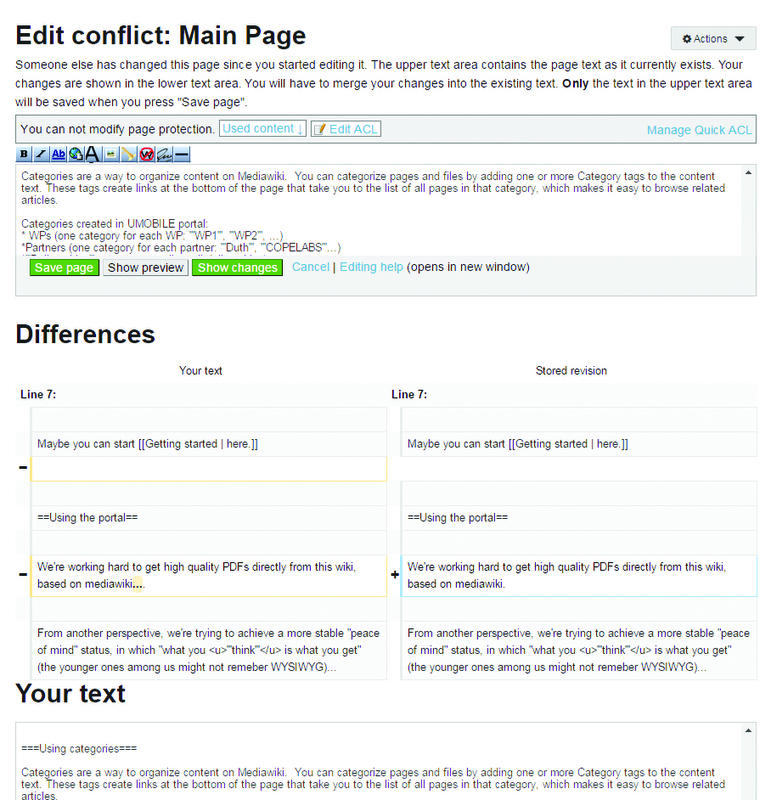 Most of the wiki sintax is properly converted by the tool. Here you can find a short documentation. More features have been added to the basic tool, as described here. If you find any 'strange behaviour' please let us know. The watchlist is a display for tracking changes, similar to the Recent changes display, but limited to showing changes only across your set of "watched" pages. You can see your watchlist by following the "Watchlist" link in your account menu (on the top right). Before you see anything interesting here, you have to actually add some pages to your watchlist. Do so by navigating to a page that interests you, and click the "Watch this page" flag. The email notification is also enables, that is you can receive, if set in your preferences, an alert for each new change in your watched pages. A latex based template for deliverables has been created and it's ready to be used choosing the "Deliverable" option under the "Create PDF" tab in the top bar. export to PDF choosing the "Deliverable" option under the "Create PDF" tab in the top bar. Description: still testing the template! This page was last modified on 29 April 2016, at 10:42. This page has been accessed 422,197 times.